A kurta (Hindi: कुर्ता, Bengali: পাঞ্জাবী, Punjabi: ਕੁੜਤਾ, Urdu: كُرتا‎ pronounced [ˈkʊrt̪aː]) is an upper garment for men and women, originating in the Indian subcontinent, with regional variations of form. The word kurta is a borrowing from Urdu, Hindustani, originally from either Sanskrit kuratu/kurtaka or Persian (literally, "a collarless shirt"). It was first used in English in the 20th century. A kurta worn by females is called a kurti. The kurta is traditionally worn in Pakistan, Bangladesh and India and is also popular in Nepal and Sri Lanka. The kurta is worn with a Dhoti, Paijama, Shalwar, lungi or jeans. The kurta is similar to the perahan worn in Afghanistan, the phiran of Kashmir and the daura of Nepal. The straight cut kurta is a loose shirt falling either just above or somewhere below the knees of the wearer, and is traditionally worn by men. However, women do also wear the straight cut kurta or its shorter version, the kurti. They were traditionally worn with loose-fitting paijama (kurta-paijama), loose-fitting shalwars, semi-tight (loose from the waist to the knees, and tight from the calves to the ankles) churidars, or wrapped-around dhotis; but are now also worn with jeans. Kurtas are worn both as casual everyday wear and as formal dress. Imported straight cut kurtas were fashionable in the United States in the 1960s and 1970s, as an element of hippie fashion, fell from favor briefly, and are now again fashionable. South Asian women may also wear this Western adaptation of South Asian fashion. Some styles, button or are tied at the shoulder seam and have plackets rather than slits. The opening may be centered on the chest, or positioned off center. 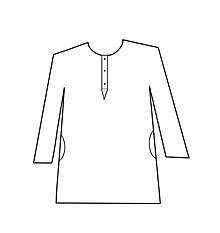 Traditional forms of kurta do not have collar. Modern variants may feature stand-up collars of the type known to tailors and seamstresses as "mandarin" collars. These are the same sort of collars seen on achkans, sherwanis, and Nehru jackets. A kali or kalidar kurta is similar to a frock and has many panels. The kalidar kurta is made up of several geometrical pieces. It has two rectangular central panels in the back and the front. The kali kurta is worn by men and women. The Bhopali kurta (taking its name from Bhopal) is a loose kurta with pleats at the waist flowing like a skirt reaching midway between the knees and the ankles. It is worn with a straight pajamma. The Bhopali kurta was popular with the local royal families and is believed to have been adopted from the dress of Turkey by Sultan Jehan Begum who reigned between 1901 and 1926 A.D. The Hyderabadi kurta is named after the former royal state of Hyderabad and is a short top which sits around the waist, with a keyhole neck opening. It was popular with the local royal households. Traditionally, the Hyderabadi kurta was of white material but modern versions can be of any colour. Over the kurta, some versions have net material the combination of which is called jaali karga, worn by men and women. 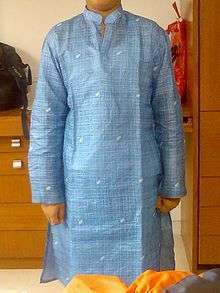 The traditional Lucknowi kurta is can either be short or long using as much as 12 yards of cloth. The traditional Lucknowi kurta styles have an overlapping panel. However, the term Lucknowi kurta now applies to the straight cut kurta embroidered using local Chikan embroidery. The Dogri men's kurta is open at the front but flares out at the hips. The overlapping kurta does not flow straight but is similar to a mini gown. Man on the right in overlapping kurta 1848. The straight cut traditional kurta (known as Panjabi in West Bengal, Bangladesh  (Bengali: পাঞ্জাবী) and Assam (Assamese: পনজাবি) and as Punjabi in Madhya Pradesh and Gujarat) or simply Punjabi kurta consists of rectangular fabric pieces with perhaps a few gusset inserts, and is cut so as to leave no wasted fabric. The cut is usually simple, although decorative treatments can be elaborate. The sleeves of a traditional kurta fall straight to the wrist; they do not narrow, as do many Western-cut sleeves. Sleeves are not cuffed, just hemmed and decorated. The kurta usually opens in the front and the front opening is often a hemmed slit in the fabric, buttoned at the top. The traditional straight cut kurta does not have a collar but modern versions do. The use of side slits in the straight cut kurta can be traced to the 11th century C.E. female kurtaka worn in parts of north India and was a short shirt, with sleeves extending from the shoulders, to the middle of the body, and had slashes on the left and the right sides. 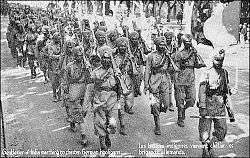 This is the same as the modern straight cut kurta which has side slits and worn by women in Punjab. Straight cut kurtas using regional embroidery designs are labelled according to the region from where the patterns originate. The Multani kurta is crocheted using designs of Multan (Punjab, Pakistan). Local Ajrak prints are also used. The Multani kurta is also known as the Saraiki kurta. A Phulkari kurta is emroidered using the Phulkari embroidery of the Punjab region. Bandhani tye-dyeing is popular in the Cholistan desert area of the Punjab region. Bandhani patterns are used on kurtas. The traditional Punjabi kurta of the Punjab region is wide and falls to the knees and is cut straight. The modern version of the regional kurta is the Mukatsari kurta which originates from Muktsar in Punjab. This modern Punjabi kurta is famous for its slim fitting cuts and smart fit designs. It is very popular among young politicians. Styles of kurta peculiar to Delhi include the wooden beaded kurta and a kurta heavily laden with embroidery. The Sindhi kurta is the traditional straight cut variety but uses local patterns to embroider the garment and also makes use of mirrors. 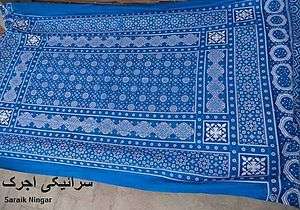 The local art of bandhani (creating patterned textiles by resisting parts of a fabric by tying knots on it before it is dyed) is utilised which is believed to have originated in Sindh and spread to Gujarat via Rajasthan and is also practiced in the Punjab region. Sindhi kurtas are also made out of heavy local material called rilli and the kurtas are often called rilli kurtas. Ajrak prints are also used. The Assamese Panjabi is worn with a scarf (Gamosa) using local prints. The Bengali Panjabi utilises local embroidery traditions. 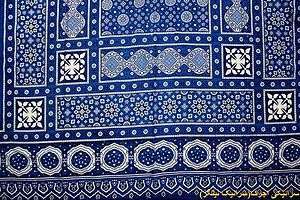 Kantha embroidery means patched cloth and is the regional style of West Bengal and Bangladesh. Kantha is also traditional in Odisha. 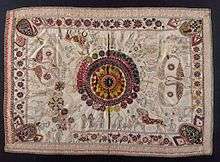 The other variety of embroidery from West Bengal and Bangladesh is the Nakshi kantha. 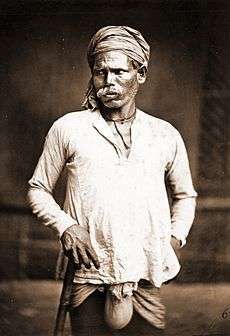 Man in short kurta, East Bengal (Bangladesh), 1860. Pakistan Frontier Constabulary soldiers wearing kurtas at Torkham border crossing gate. Bhangra Dance performers in Punjab wearing Kurta and Tehmat. Pahari (Hill) women in kurtas, Kashmir, 1890. Kurtas are often worn with jeans. Women sometimes wear kurtas as blouses, usually over jeans pants. Jeans are sometimes preferred over pajamas or leggings as they are more durable for rough use. Most colours kurtas match with blue jeans. In 2014, an Indian family court in Mumbai ruled that a husband objecting to his wife wearing a kurta and jeans and forcing her to wear a sari amounts to cruelty inflicted by the husband and can be a ground to seek divorce. The wife was thus granted a divorce on the ground of cruelty as defined under section 27(1)(d) of Special Marriage Act, 1954. Ladies kurtas/blouses, along with leggings are most popular in India, Pakistan, and the South Asian community in Singapore and Malaysia. Hand crafted long ladies kurta with pink leggings. White printed ladies kurta with pink leggings. In modern usage, a short kurta is referred to as the kurti. However, traditionally, the kurti refers to waist coats, jackets and blouses which sit above the waist without side slits, and are believed to have descended from the tunic of the Shunga period (2nd century B.C.). Kurtis are typically much shorter than the traditional garments and made with a lighter materials, like those used in sewing kameez. Kurtas worn in the summer months are usually made of thin silk or cotton fabrics; winter season kurtas are made of thicker fabric such as wool or Khadi silk, a thick, coarse, handspun and handwoven silk that may be mixed with other fibers. A very common fabric for kurta pajama is linen, or linen cotton mix ideal for both summers and winters. Kurtas are typically fastened with tasselled ties, cloth balls and loops, or buttons. Buttons are often wood or plastic. Kurtas worn on formal occasions might feature decorative metal buttons, which are not sewn to the fabric, but, like cufflinks, are fastened into the cloth when needed. Such buttons can be decorated with jewels, enameling, and other traditional jewelers' techniques. South Asian tailors command a vast repertoire of methods, traditional and modern, for decorating fabric. 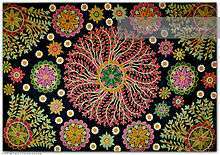 It is likely that all of them have been used, at one time or another, to decorate kurtas. However, the most common decoration is embroidery. Many light summer kurtas feature Chikan embroidery, a speciality of Lucknow, around the hems and front opening. This embroidery is typically executed on light, semi-transparent fabric in a matching thread. The effect is ornate but subtle. A traditional cotton Chikan embroidery kurta with grandfather collar and wooden cuff-links-style buttons. A traditional muslin "side-open" kurta with knot-and-loop in place of buttons. modern Indian woman in a Kurta. ↑ McGregor, R. S. (ed.). 1993. The Oxford Hindi-English Dictionary. Oxford University Press. 1083 pages. ISBN 0-19-563846-8. 1 2 Oxford English Dictionary, Second Edition. 1989. The first use is attributed to W.G. Lawrence in T. E. Lawrence, Home Letters, 1913, "Me in a dhoti khurta, White Indian clothes." ↑ Kemper, Steven (2001) Buying and Believing: Sri Lankan Advertising and Consumers in a Transnational World. The straight cut kurta was adopted during 1930s - 1940s but is only worn by certain men on certain occasions. 1 2 "Regal chic", The Telegraphk, Calcutta, April 24, 2004. Quote: "The first sequence was a range of traditional saris in silk and cotton, moving on to kurtis and jeans and short kurtas in silk and georgette." ↑ Oxford Dictionary of English "(Punjabi) a long kurta (loose collarless shirt)"